Knowing I was going to be getting up and away in the pre dawn darkness brought back childhood memories of Christmas. I got an early night, full of excitement about what the day would bring. There was ice on the windscreen, bright stars up above. The forecast looked reasonable, maybe it was going to be better than expected? On the drive to Grasmere, I could see the outline of the hills, white against the dark sky. I parked up in the lay-by opposite the sports ground, and set off in the early light. It was exactly 6.30am, so I was bang on schedule. An ambitious day was planned, and I hoped to be back in time for lunch with Claire, before some work related meetings in the afternoon. I’d only been going a few minutes when the clear morning sky suddenly hazed over. 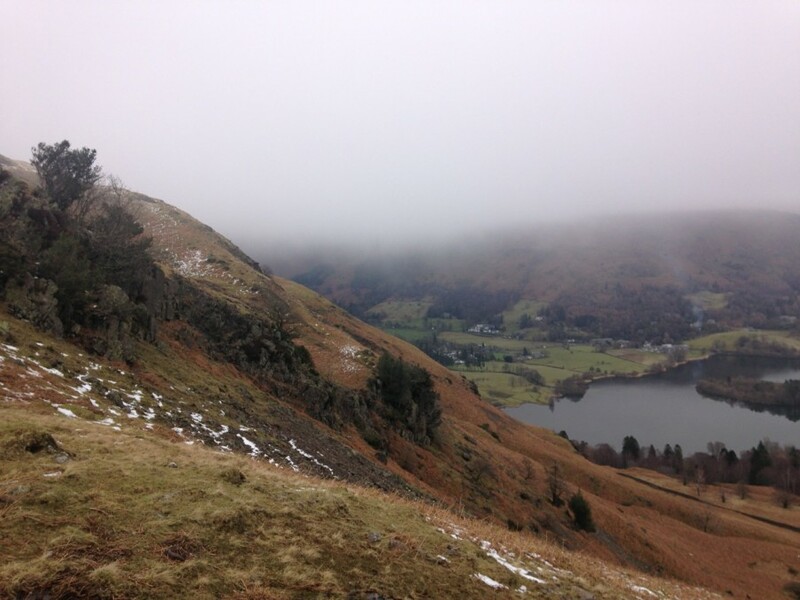 At first I thought it was mist, yet as I ran through the quiet streets of Grasmere, snowflakes were falling. A roe deer stag, with superb antlers covered in velvet, looked up through the light snow flurry. 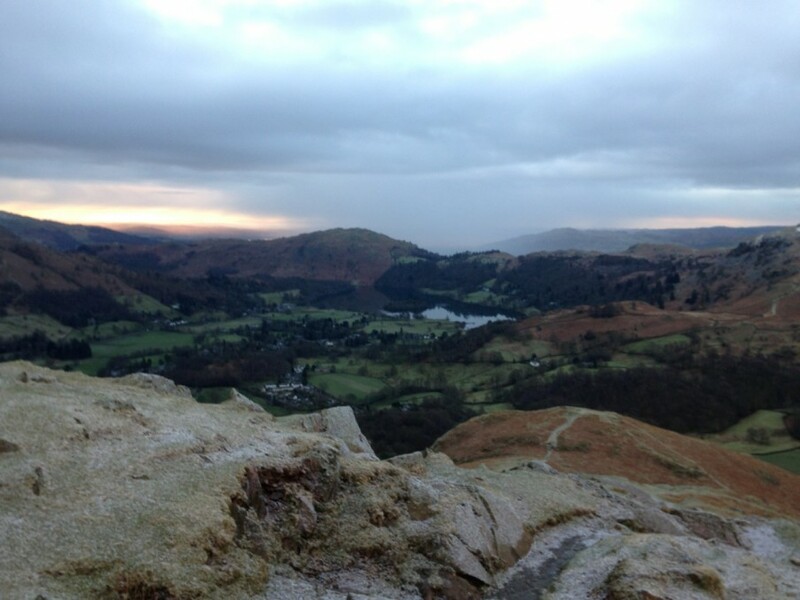 I was most of the way up the first climb to Helm Crag, the “Lion and the Lamb”, the sunrise an orange glow on the far side of Grasmere Water. 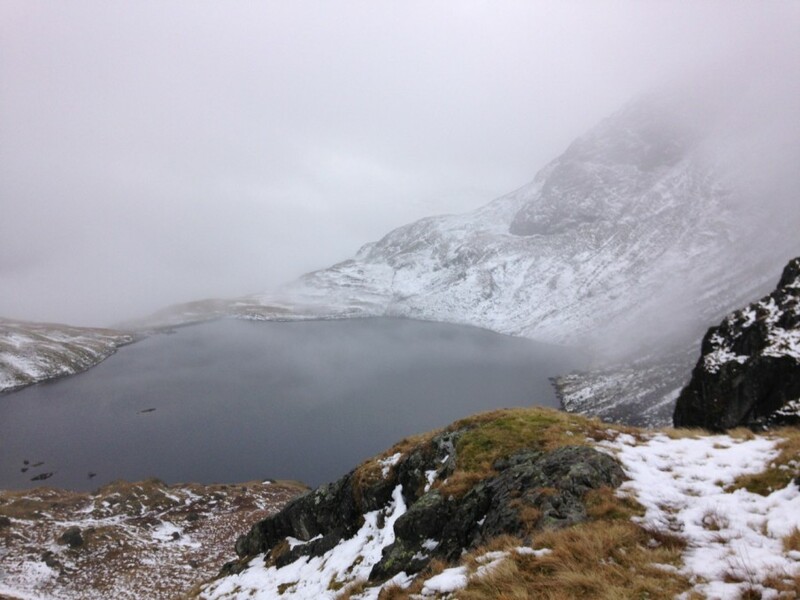 Higher up, hard patches of snow, the rocky scramble to the summit crag made more difficult with a veneer of ice. I suddenly remembered once getting stuck coming off this crag. It was one of those embarrassing moments and I had an audience of three Swedish women, not, I hasten to add, svelte Scandinavian beauties, although maybe they once were. I’d climbed up the rock and must have taken a slightly different route down. I just couldn’t reach a ledge with my foot, and was clinging on by my fingertips, draped over the smooth rock with my audience offering words of encouragement. It felt like it took an age to get down, and the three of them “clapped”. The shame of it. Another snow shower, making the easy ridge run a lot more exciting, snowflakes covering up both grass and ice, making my footing a lottery. 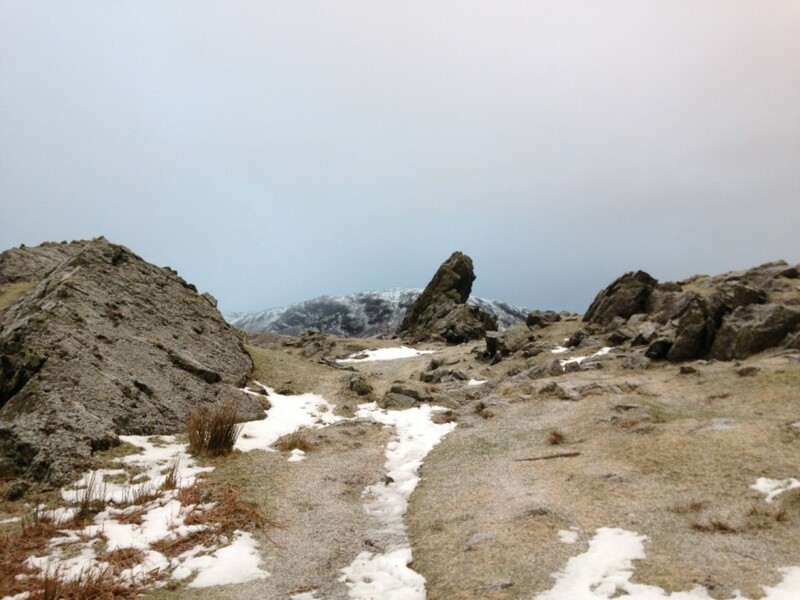 It was easier to avoid the path altogether, as this was where most of the icy sections lay hidden, first to Gibson Knott, then Calf Crag. The cloud was lifting and the day’s first shaft of sunlight lit up the stream in the valley. 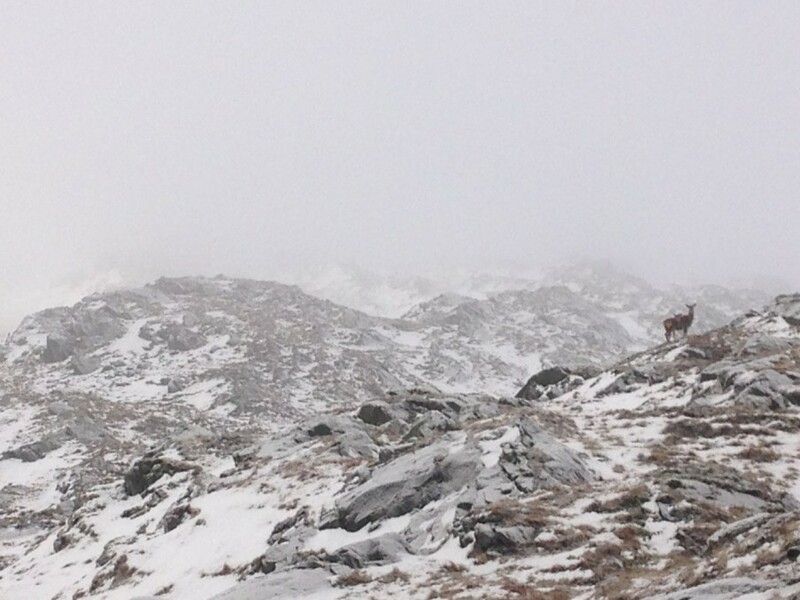 Deeper snow on the traverse round to Tarn Crag, two Red Deer, standing stock still, watching my progress. I couldn’t resist a quick jog down to the cairn and the splendid view overlooking Easedale Tarn, made even more special as the sun was now trying to come out. 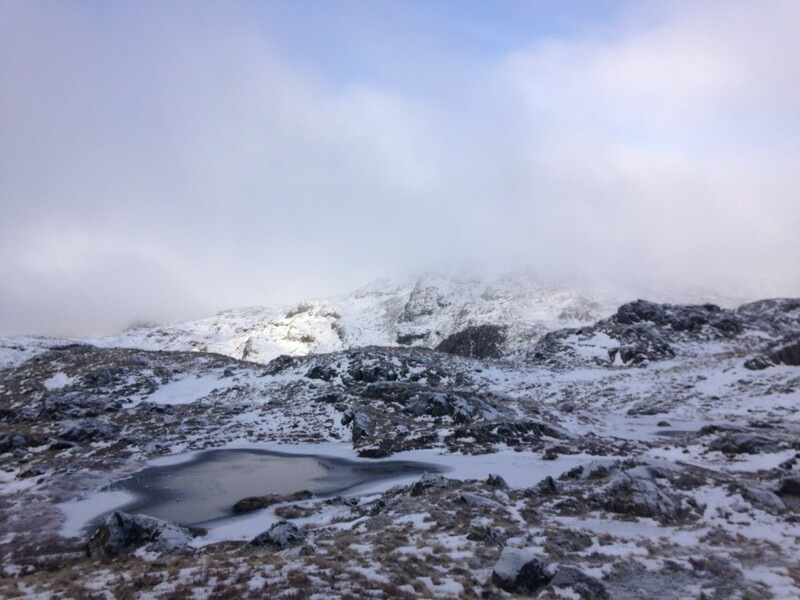 On up the climb to Sergeant Man, through ever deeper snow, even some knee deep snow drifts. As I climbed, the clouds built up, until everywhere was white. The ground, the sky, even the air. 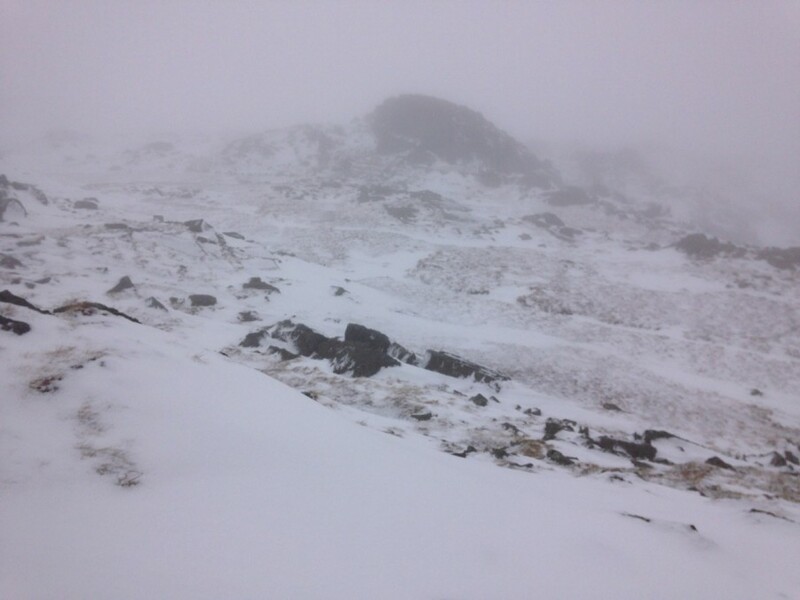 Visibility had suddenly reduced to a few metres, and now there were sections of rock hard snow underfoot, interspersed with calf deep soft snow. I couldn’t find Sergeant Man. I looked everywhere, ran up every lump that loomed out of the whiteness. Eventually I gave up, got my map and compass out and took a bearing to High Raise, which I knew had a distinctive trig point on the summit. From here, I set the compass back to Sergeant Man, finding it just a few metres beyond my old footprints. From Thunacar Knott, another bearing through the clag, to Pike of Stickle, which had disappeared too. I wondered about my compass bearing, nothing on the ground made any sense with the map, then suddenly the black wall reared up out of the gloom. 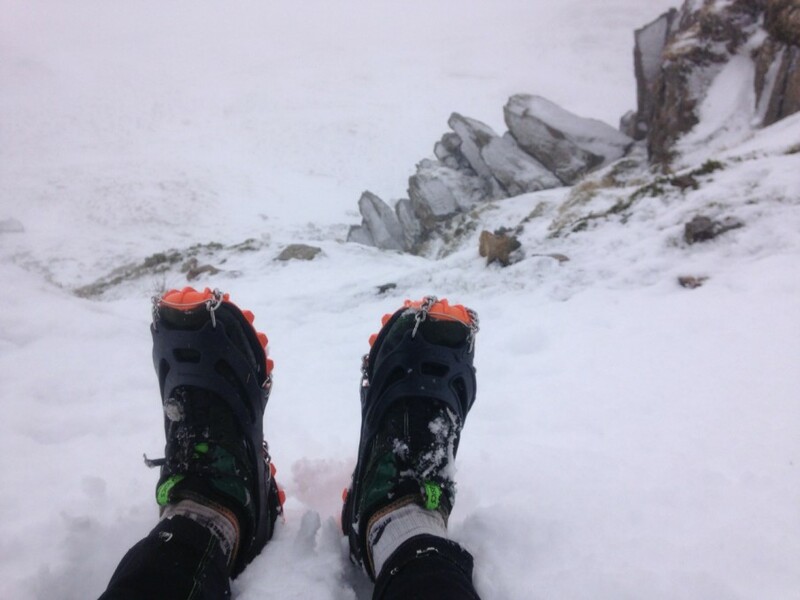 I needed micro spikes for the final rocky ascent on snow and ice. 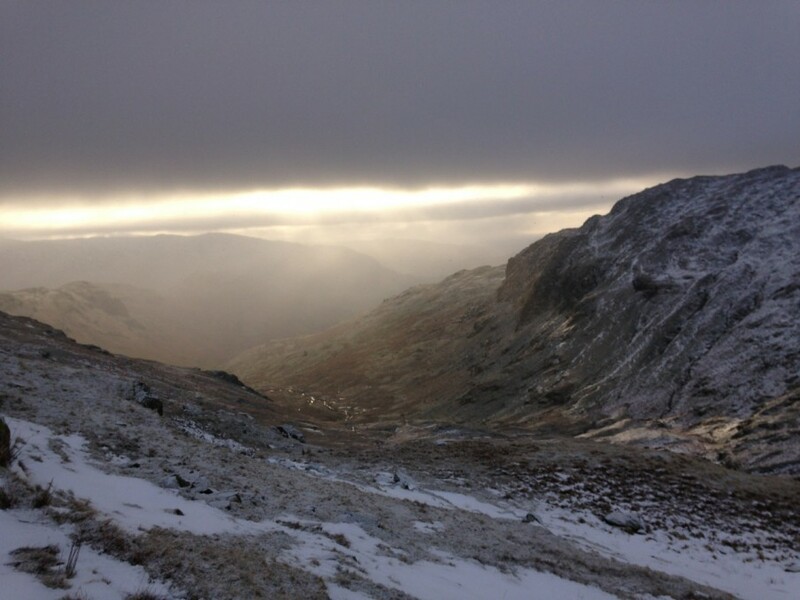 The Langdale Pikes are clustered in a tight group, a Wainwright bagger’s dream. 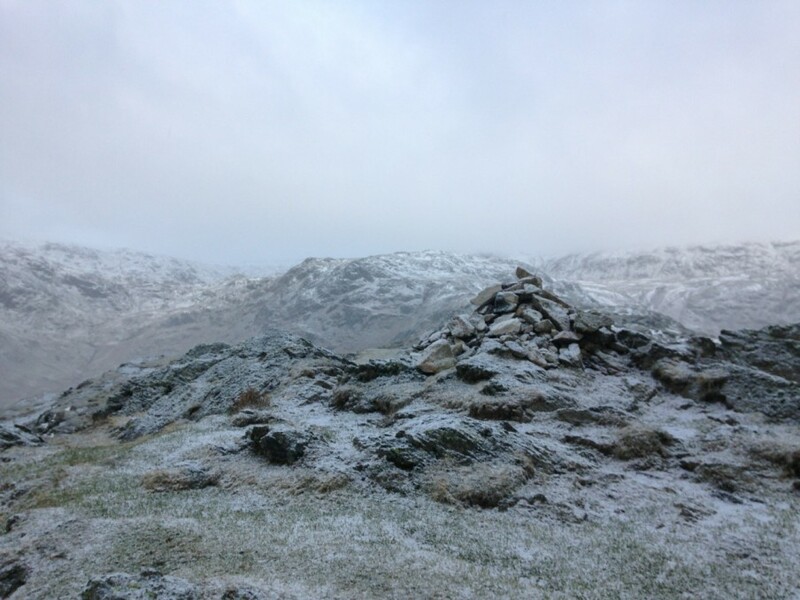 Through snow sculptures and deep snow drifts to Loft Crag, Harrison Stickle then Pavey Ark, every footfall a possible broken ankle. Dropping down to Bright Beck, the dense cloud broke up and gave misty views of Stickle Tarn. Now I could actually see the landscape ahead, it was warmer too, so I took my cagoule off, and stuck it in my pack along with the map and compass. It’s all easy and familiar from here. And then before I knew it, I was lost. Thick white cloud had enveloped me again. 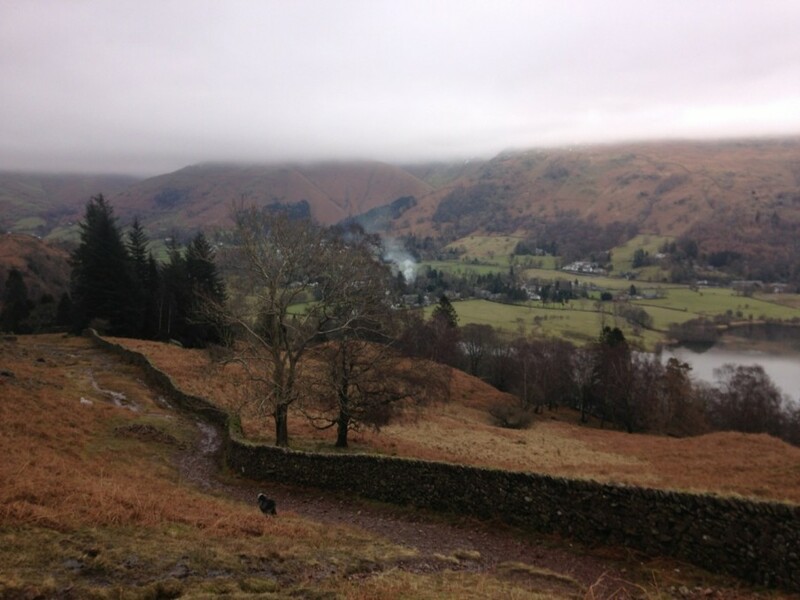 I hadn’t bothered to take a bearing, and just ran in the direction of Blea Rigg, knowing exactly where it was. Yet a very brief glimpse in a gap in the cloud revealed the distant rocky weir of Stickle Tarn. I’d somehow veered way off route, heading towards Langdale! Out with the map and compass again, trusting the bearing, not my instinct. I got very tired on the long drag to Silver Howe. 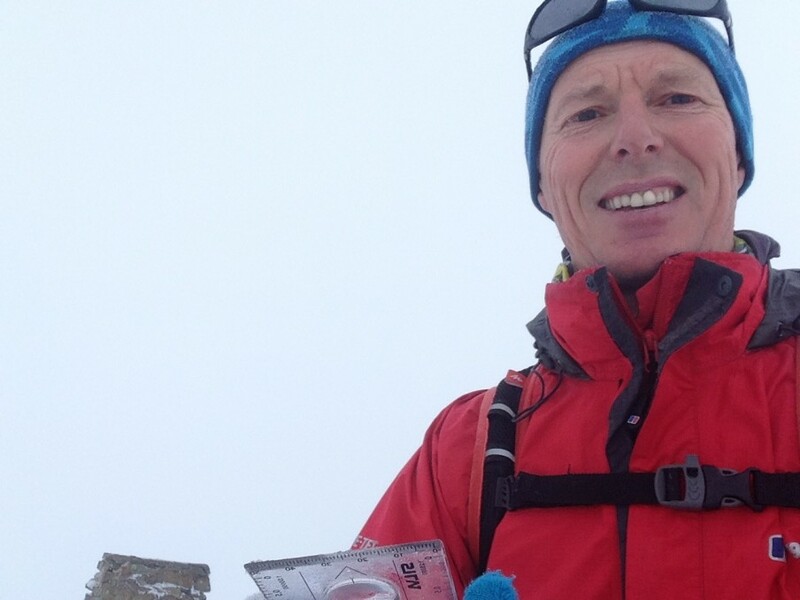 This is usually a favourite ridge run, although the wet snow and zero visibility made it very hard work, and it was a relief to finally reach the summit. Coming out of the cloud on the descent felt like coming back down to earth. It was a relief to see colours again after the incessant whiteness. I sent a message home, saying I’d be a bit late for lunch. 13 Wainwright summits today, that’s 60 down, 154 to go. 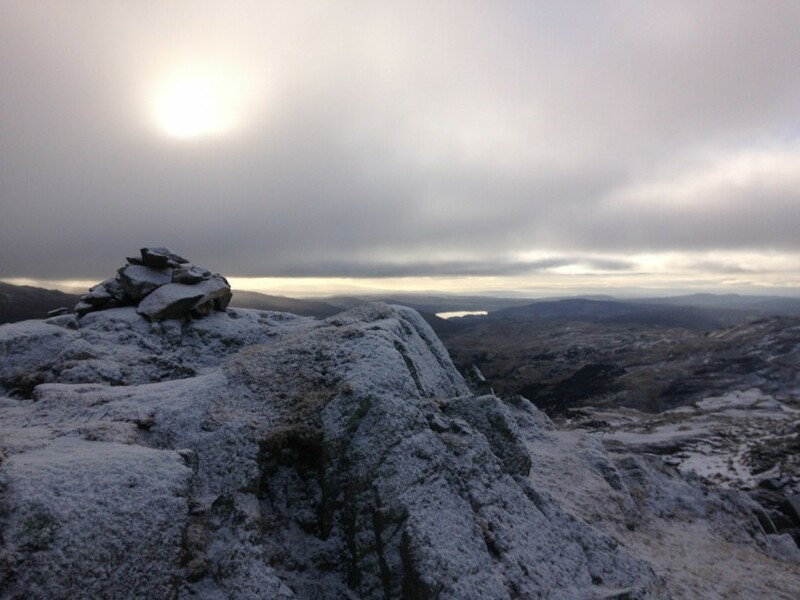 This entry was posted in Best Of, Blog and tagged bagging, Lake District, Lakeland Trails, run, running, summit, trail, trail running, trails, ultra run, Wainwright. Bookmark the permalink.